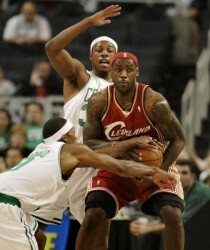 Bostonâ€™s Paul Pierce and Rajon Rondo, left, pressure Clevelandâ€™s LeBron James in the first half. If you play for Mike Brown then you better play defense or you will be sitting next to him on the bench. After the Cavaliers lost to the Celtics (96-94) in Friday’s game in Rhode Island, Mike Brown held a special practice today to remind his players about the team’s principles. Eric Snow reached a deal with the team to become an analyst for NBA TV. He is still with the roster but the team has filed a disability claim in hopes of getting his $7.3 million salary removed from their books. After missing two seasons for micro-fracture surgery, former Cavaliers Darius Miles signed as a free agent with the Boston Celtics last August. River doesn’t know what to expect of him but he didn’t like what he saw from him last night. That’s why he only played 3 minutes. If Miles makes the Celtics, heâ€™ll have to serve a 10-game suspension for taking an appetite suppressant in violation of the leagueâ€™s anti-drug policy.